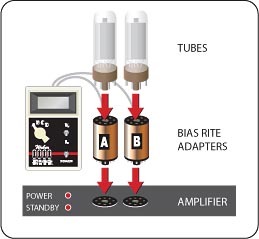 Insert tubes into Bias Rite Adapters, and the adapters into the amp’s tube sockets. Turn the amp’s power on, and let the tubes warm up as you would if you were turning your amp on to play. Once the tubes have warmed up, switch the standby off so the amp is in operating mode. Turn the power on the Bias Rite on and set the V.I. switch to Ik. This will show you the tube’s idle current (bias) in milliamps (mA). 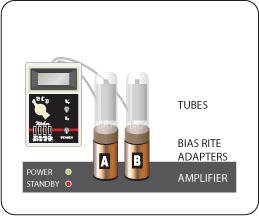 usually located inside the chassis or underneath it, adjust the tubes’ bias current to the desired level. Switching between the sockets will show each tube’s current on the meter. Switching the V.I. 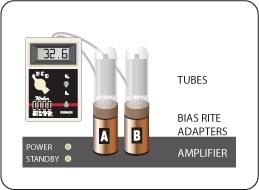 switch to Vp will allow you to measure the plate voltage of each tube.